After sadly losing his father, Bryan, to pancreatic cancer in February 2017, George has been super determined to support Pancreatic Cancer Action in everything he does. Especially with his long-distance running adventures. Having previously represented us in the Jurassic Coast Challenge and the Great South Run in 2018, George is embarking on the South Downs Way 100 Challenge in June 2019. This event is a gruelling 100-mile race taking in the entire South Downs Way National Trail – not for the faint hearted! An event such as this one takes a paramount training schedule and George certainly hasn’t let anyone down – with morning pre-dawn runs, 10-mile nocturnal training runs starting at 2am on 2 hours sleep (we don’t know how he does it either?!) and pre-work commute runs from Clapham to Islington. “Just got to Wellington, New Zealand, and have an overnight here before heading to Christchurch…..then basically all-round the south and north island for three weeks. I bought out the flag and water bottle to use as advertising props for PCA, especially on the Tongarira Alpine train (google it, it’s stunning) which I will be doing as the other three I’m travelling with don’t do runs or big walks. The South Downs Way 100 (mile) is in about 17 weeks time so I need to be ramping up training…. and I need to get as much as I can done through February whilst away on holiday. I of course must not do so much that it affects the others on holiday but must keep it up otherwise at my age (Very nearly 60) you lose fitness very quickly. Singapore was very tough going as the temperatures were around 30 deg C with very high humidity but managed a few runs to keep me going. I am planning to get a run in at least every 3 days, more if travel plans permit. Once back in the UK, end of February, I will start actively fundraising for the SDW-100 in June. 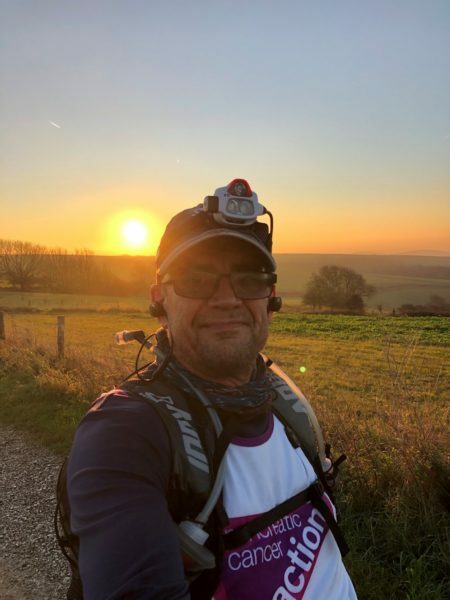 George is a total inspiration to us here at PCA and we wish him the world of luck with his South Downs Way 100 Challenge in June 2019. Previous Article February 4th: World Cancer Day Next Article Pyjamas for PanCan is back for 2019!